I made this when I couldn't find a way to get the square root of a number in MUGEN(during play) for a piece of code that uses Pythagorean Theorem. I'm new to MUGEN coding so if there is an easier way please let me know! value = var(5)+var(4)+var(4)+var(2) + 4 ; All sides + number of sides. 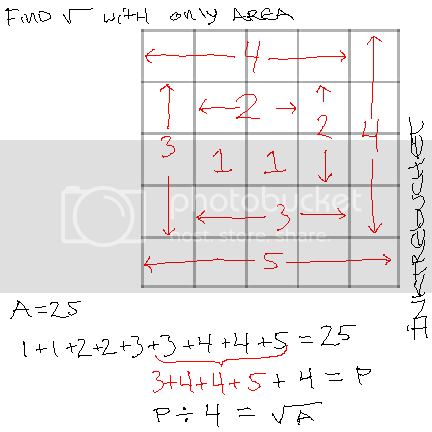 value = var(6)/4 ; perimeter divided by number of sides. x ** 1/2 is the square root of x. There's many methods of calculating a square root: trigonometric, exponential, approximating via series, etc. If you ever make use of the exponential or trigonometric functions while you calculate it, you will end up with the same result. I advice against wasting variables for doing this. Thank you for sharing that one! I just found http://mugenguild.com/forum/topics/square-roots-and-general-roots-mugen--6588.msg64497.html#msg64497 recently too. My ignorance of mugen code fueled this one. It was fun anyways. Hopefully this thread will help anyone trying to find square root functions, find them a little easier. For a fun exercise, I came up with another way of calculating a square root after reading this thread. This is based on an old geometric construction by Euclides (I believe). x should be written in float form. I am very impressed to see your formula do the same work! Thank you for sharing it here.